At the Define PEST Parameters step, select which model input types you wish to include in the PEST run. This list of available parameters will be extended in future versions to include more parameters from both the flow and transport models. Select the check-box in the Use column in order to include this parameter zone. •Tied: The parameter value is tied (linked) to the value of another parameter, in which case this parameter takes only a limited role in the parameter estimation process. If you select the tied to option, then you can select the parent parameter from the dropdown list. Please Note: you can only tie to other parameters that have been selected/included in the PEST run). PEST does not allow a parameter to be tied to a fixed parameter, or a parameter that is already tied to another parameter. If a parameter is tied to a parent parameter, the parameter “piggy-backs” on the parent parameter during the estimation process. In this way, the ratio between the initial values of the parameter and its parent remain constant throughout the estimation process. In many cases, the linearity assumption on which PEST is based is more valid when certain parameters are log-transformed. This means that the log-transformation of some parameters can often make the difference between success and failure of the estimation process. However, a parameter that can become zero or negative during the estimation process must not be log-transformed. •Fixed: The parameter value is fixed and takes no part in the parameter estimation process. •Log: The parameter will be log-transformed (i.e. the log value of the parameter is optimized rather than the ‘real’ value of the parameter). If the parameter is log-transformed then the covariance, correlation coefficients and eigenvector values refer to the log of the parameter. However, the parameter estimates and confidence intervals refer to the untransformed parameter. If you fix a parameter, its value will be fixed at its initial value, and it will not be part of the estimation process. 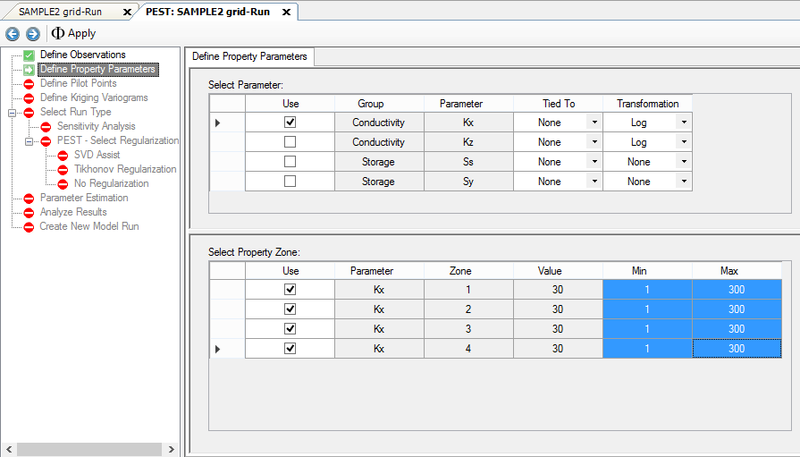 In the table at the bottom of the window, select which parameter zones you wish to include; by default, all zones from a selected parameter type will be included. The Value column indicates the value for each zone; in the case where you have distributed parameter values in a zone, you will see "Distributed" in this column. The Minimum and Maximum are the lower and upper bounds of the parameter zone. The lower and upper bounds should be chosen wisely; for example, if you know that a zone represents an sandy-gravel aquifer, then define practical limits for the upper and lower bounds for conductivity for sandy-gravel. The default values are 1E-15 and 1E+30 respectively. The lower and upper bounds are ignored for fixed and tied parameters. If an updated parameter value is outside of its bounds, PEST temporarily holds the parameter at its boundary value. If you have completed a PEST run and return to the Define Parameters step to make a change (such as add/remove zones or adjust the Minimum or Maximum values), you need to click the [Apply] button on the workflow toolbar, and also proceed through the Define Pilot Points step, and re-generate the Define Kriging Variograms step in order to update the appropriate input files.